When you receive your NordBord, some assembly will be required. 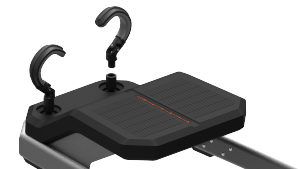 Shipping the NordBord disassembled significantly reduces its shipping costs for you, and will make it more transportable should you wish to take it on the road. Remove dangling bolts from NordBord legs. Leave the other bolts screwed in, but loosened. Slot legs onto NordBord Base Unit. Take care and watch your fingers!! goes on the outside of the leg. Install 8 x bolts (4 per leg) to secure legs. Tighten them firmly with small Hex Wrench. remove them at a later point.